Forum: just about the right size of a venue for A Perfect Circle, where many of us imagined the tickets would sell out in no time. Turns out the allure of Maynard James Keenan's other band has faded somewhat since the glory days of the early 2000s, because the show was moved to Forum's brand new "Black Box" constellation, which cuts the venue in about a third of its size and encompasses that section in black curtains for a more intimate feel. Based on a rough eye estimate, around 2500-3000 patrons turned up at the venue, a far cry from our personal expectations but just enough to make for a packed experience. 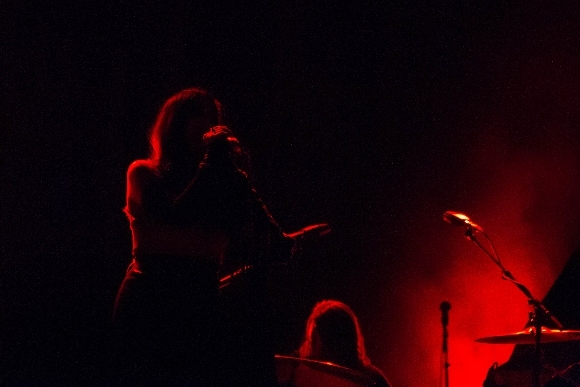 First up is the much-hyped blackened presence of Chelsea Wolfe. Playing in almost total darkness with only the occasional dark blue or red lights flashing, you can barely make out the figure of Wolfe, who seems to be dressed in a gothic gown of sorts that reflects their musical style quite accurately (doom, folk, gothic combined). The slowly creeping, crushingly heavy expression is driven by dark ambiance and atmosphere, meaning you have to engulf yourself into their art form as a whole because the songs don't exactly leave anything to remember them by. Add to the fact that each time Wolfe reaches out to the higher pitch part of her range, I draw mental comparisons to having heard cats screech better, but that's probably just me and this type of music is not for me. After all, I once went to a Swans show and thought it was equally weird, and that's not meant in a positive manner. That said, there are a few highlights to their set, mostly surrounding the heavier moments where their bassist lets loose and begins throwing around his instrument while running across the stage. The worst moments? When they just stand still and go for the dark ambiance. First-time listeners won't exactly get much out of it. In the end, Wolfe finishes a set where most people have gazed on with puzzled expressions by kneeling down and screeching in what is supposed to be a climaxing moment by the looks of it. My opinion? Not necessarily bad, just boring. There's a strict no photo/video policy in effect tonight courtesy of the band. Both in advance of the Chelsea Wolfe set, in between, and just before A Perfect Circle's headling set we've heard PA about a zero-tolerance policy for any use of any electronic devices during tonight's show. While that puts some difficulty to note-taking for us reviewers, from the audience perspective it's wonderful: everyone's in the present, fully concentrated on the depth-laden, lush soundscapes that are found on especially the new album, "Eat The Elephant", attentive to its rich detail. Forum has often been vilified for its terrible sound, but in the black box formation, the opposite seems to be the case. The acoustics are near-perfect, exposing James Maynard Keenan's vocal performance as simply masterful. Aside for a brief moment in the beginning, the instruments and his lush voice are in perfect balance as we traverse through eight songs off the new album that requires careful calibration given the more mellow and quieter style compared to the harder hitting prog rock pieces that we hear in between (compare "Weak And Powerless" to "Disillusioned", for instance). It's easy to see in crowd reaction which ones are favored, but not by a wide margin: seems like the new album has been received rather well by the audience. The stage setup is spectacular in its caliber of delivery compared to how little equipment is on stage. 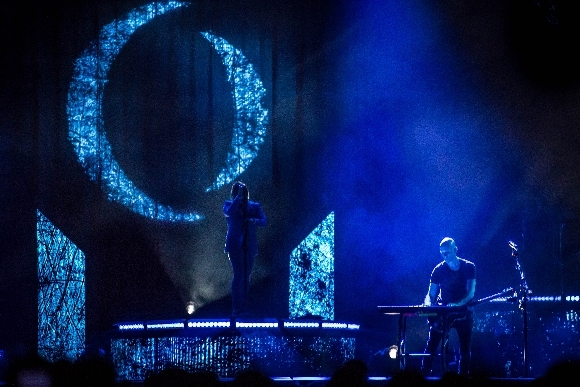 There are three circular platforms of different heights growing from small to big towards the back of the stage, where Maynard is positioned in the middle, almost fading away to the dark background. Above and around the band are video pillars of some kind, which provide a three-dimensional effect that's difficult to explain on paper, but looks really awesome live (AP described it as 'trippy'). The curtain behind the band also turns into a video screen of sorts, where the band's iconic logo is exposed in different constellations. Overall, it adds a great deal to their already artistic expression and creates an almost hypnotic, soothing mood at the venue. Of the tracks, the highlights are "Weak And Powerless", "The Noose", "The Doomed" (the heaviest off the new album), "Judith" and arguably also "Rose" early on. 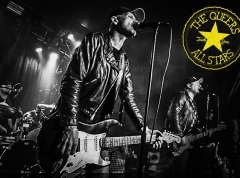 They are delivered faithfully and with crushing power, where Billy Howerdel more often than not utilizes the entire length of the stage to thrash around with his guitar to inject a surprising amount of energy to their otherwise tranquil stagemanship. This while Keenan is dancing in weird zombie-looking fashion on his platform in the back. The strict photo-free policy is lifted for the last song just in time for people to film a good twenty seconds before the show is done. 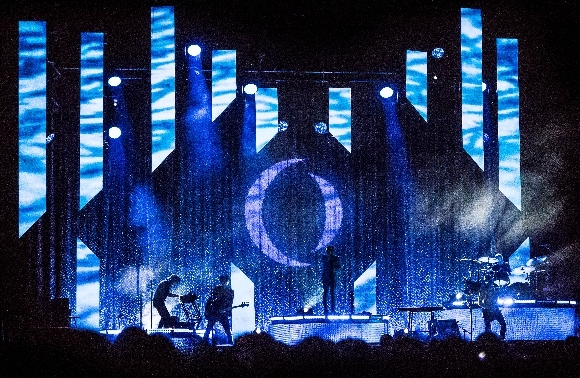 Not much spectacular happened during the concert as such, aside from the brilliant video effects and extremely solid songs, and that's exactly what A Perfect Circle's songs are also all about: quality of songwriting is sky-high, and no unnecessary showmanship is needed to make the show feel better.